Founded in 1734 by Jacques Fourneaux the trading company Forest-Fourneaux works with the Benedictines Abbey which produced wine since the 13th century, on the most beautiful Champagne vineyards. 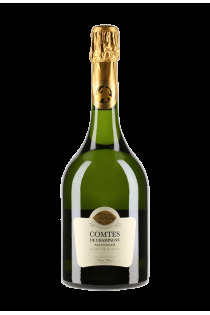 In the 19th, the company moves into the Counts of Champagne House and was purchased by Pierre Taittinger. Several years later,in the absence of descendant in the family Forest Fourneaux, Pierre Taittinger's son, François gave his name to the House. In 2005, the industry group who owns the House Taittinger is surrunded to an American pension funds. Pierre-Emmanuel Taittinger, the founder's grand-son decides to keep the Champagne "department" of the group in the founding family, and buys it in extremis...This is the beginning of a new adventure. Assisted by his children Vitalie and Clovis, Pierre Emmanuel Taittinger perpetuates the tradition of quality by favouring Chardonnay in the different vintages and by having his own vines for a best monitoring of quality. The 290 ha. estate, is planted with 40% Chardonnay, compared with 25% on the whole Champagne vineyard. Each year 5 to 5.5 million bottles are produced for 12 million bottles in stock.